In 2015, the number of individuals fleeing persecution, generalized conflict and economic hardship and seeking to enter Europe from the eastern and southern Mediterranean doubled compared to 2014.6 This phenomenon gave rise to three challenges for major news outlets. First, what should they call the phenomenon of the rise in people seeking to enter the European Union; second, how should they label the people; and third, how should they represent the people behind the label? On the first challenge: how to describe the phenomenon, most media outlets settled on “crisis” and relied on the terms “flood,” “wave” or “deluge” to connote the scale.7Other outlets controversially echoed UK Prime Minister Cameron or French far right politician Jean-Marie Le Pen’s references to “swarms” and “barbarian invasions,” adding a sense of danger and chaos to the emerging phenomenon.8 A few outlets, such as the British tabloid The Sun, reverted to overtly racist commentary, likening the new arrivals to an infestation of resilient cockroaches, resistant to fumigation. While this string of analogies captured readers’ attention and evoked strong emotions, they also often misrepresented the scale of the phenomenon and failed to place it in the appropriate context. For example, migrants make up only about three percent of the world’s population, while refugees make up only 0.3 percent. Increases in migration have more or less kept pace with increases in the global population over the last 45 years. Similarly, while the number of individuals seeking to enter Europe may have doubled in 2015, 84 percent of refugees worldwide are hosted in a small handful of developing countries, not by countries in Europe. In other words, in the global context of migration and refugee flows, the individuals that sought to reach Europe in 2015 represented neither a deluge nor a flood, but rather a stream. In 2015, major news outlets faced a second challenge: how to label the individuals seeking to enter Europe? The most common labels included “migrant,” “asylum seeker” and “refugee.” Each of these three labels, however, implies different obligations on the part of the international community and the receiving state and thus should not be arbitrarily applied. Given the heterogeneity of the flows, how were newsmakers to label those within them? In addition, news outlets also had to grapple with shifting definitions attached to common labels. Against the backdrop of the “crisis” and the rise of anti-immigrant sentiment across Europe, common labels – such as refugee and migrant – acquired new, pejorative social meanings. As a result, some media outlets took an official stance on which labels they would and would not use, no matter the dictionary or legal definitions. Al Jazeera, for example, ceased using the term ‘migrant’ in their coverage of the crisis as they felt the term “dehumanized and distanced” the subjects of their coverage, and, as a result, made their stories easier to dismiss. Instead, Al Jazeera contended, why not just call them “people”? Other outlets, in contrast, insisted on using “migrant” as a means of reclaiming the term from those who would use it pejoratively. Without a common vocabulary to describe those seeking to enter the EU, many media outlets became caught in the political fray. The third challenge, against the backdrop of the 2015 European “crisis,” was perhaps the most challenging: how should the international news media represent the individuals behind the label? Some opted for statistics and others for personal narratives. Some reported from the point of arrival while others sought migrants out along their journey. A few journalists returned to the point of origin to gather information on the conditions that had caused so many to leave. Depending upon which approach was used, a very different story emerged concerning a person’s or group’s interests and needs. Yet short, fast-paced reports dominated the news cycle, often (both inadvertently and purposefully) reinforcing tropes of migrants or refugees as ‘profiteers’ or ‘terrorists’ on the one hand or ‘victims’ and larger-than-life ‘heroes’ on the other. The prominence of these narratives left little space for the complex humanity of the individuals to emerge, and, as a result, reinforced a narrative of difference between them and the host population. 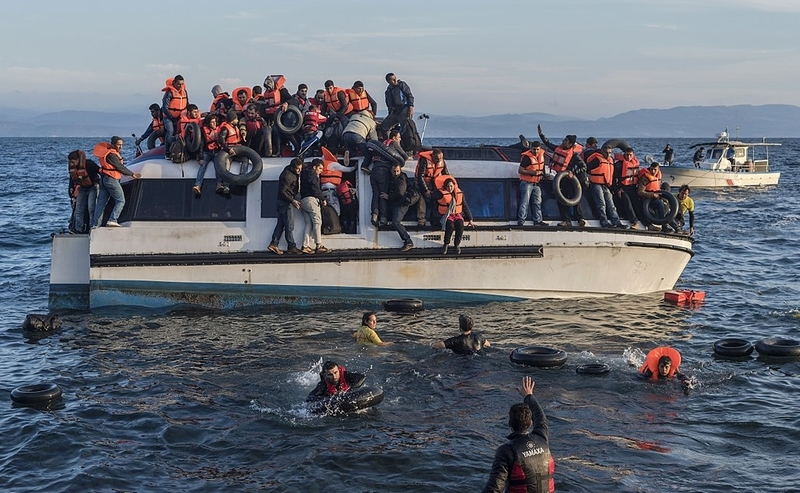 What challenges do journalists face covering mass migration? The report outlines a few specific challenges that came up during 2015, as migrants tried to seek safety in Europe. What were they? What associations come to mind when words like “flood” “wave” “influx” “swarms” or “deluge” are used to describe migrants? What word would you use to describe a large group of people migrating in search of safety from violence? One BBC reporter noted, “What we are hearing on our radios and seeing on our screens are images and sounds that portray the volume of people. And the way to dehumanize them is just to [concentrate on volume]. And the way to keep them as human beings … is to talk to them. To hear their stories as individuals, as opposed to as part of a trend.” Do you agree with their suggestion? What is gained by talking about migrants as “individuals, as opposed to as part of a trend”? What is lost by solely focusing on individuals and individual stories? Studies suggest that people often over-estimate the number of immigrants in their countries and communities as well as the religious and cultural differences between immigrants and the communities in which they have settled. What is the role of journalists in breaking down those misperceptions? What can media do to counter myth, misperception, and stereotypes?